11 people have purchased this product in the last 7 days! 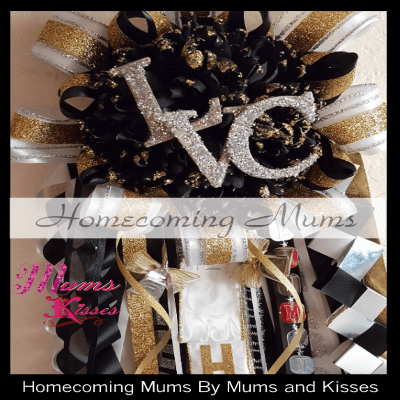 Pee Wee Garter – Homecoming Mum, is a for the younger boys. 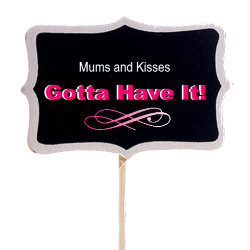 We love these little mums! For elementary and middle school age, these are a perfect size. They are big enough to look like the “big boys” do when they wear their full sized mums. We use 4 inch mums that end up being aprox 6.5 inches wide and 12 inches long. The Pee Wee Garters only comes in a single, but can be customized like all of our designs! 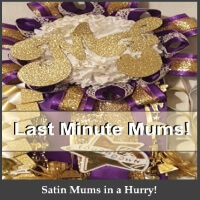 We use high quality satin ribbons in pee wee mum as well so you get the same quality in the pee wee version as you would any of our other garters or mums. Make Your Mum Make A Difference – Your purchase today will also benefit the charities we support this season. 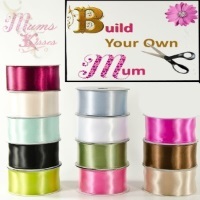 You will get a chance to choose an option to add a ribbon or bell to your mum. Mums and Kisses will match your donation while supplies last. The proceeds will benefit your choice for Breast Cancer Awareness, The Alzheimer’s Association or the Aaron Singleton Scholarship Fund #33 Joshua High School. The Pee Wee Garter can be highly customized. 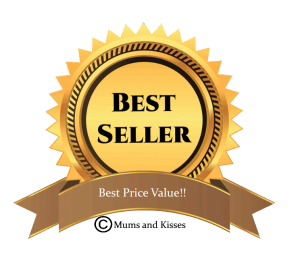 Below in the order form you will be able to select your name ribbons, activity trinkets and garland, bells and more which are all included in the price. You’ll also be able to add on additional items like an extra activity, extra jingle (bells), etc at a low cost. 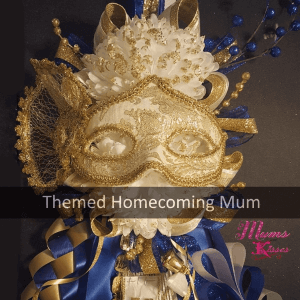 Full Pointed Double Ribbon Outer Mum Décor. 1 Ribbon Loop Cord included with “HOCO” put in block letters. 2 Garland Strands for the shine factor! Have Questions? See our FAQ Page, or Chat with a Mum Helper via our Live Chat. We may not have the plush animal head you're looking for but that doesn't mean we can't custom cut one! Example: This is a Blue Jay custom cut mascot with football and player number. Custom cut mascot heads are flat, done on stock board they are NOT plush like the stuffed animal heads. You may add one mascot, one sport and 1 jersey number if you like. Write your customizations in the box below the example photo. 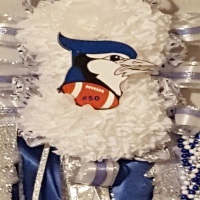 Homecoming loops are included, However there aren't any braids included in the pee wee mums, but we do allow you to add 2 braids of your choice for a small fee. Our braids include with bows at the bottom. How Many More Bell Strands Would You Like? Please note: This selection is in addition to any bells that may be included in your product. Each strand contains 2 bells and 2 bows.